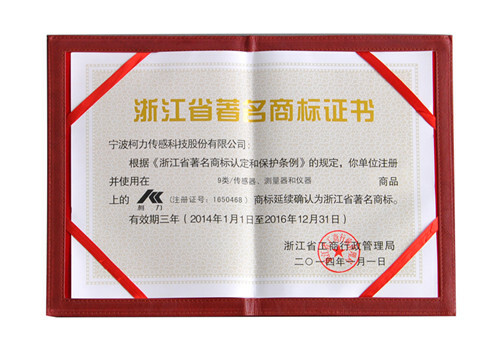 Recently, learned from the Zhejiang Provincial Administration of industry and commerce, The trademark of KELI Sensing Technology (Ningbo) Co., Ltd, registered for applications on ninth species of "sensor, measuring apparatus and instruments" (Registration No. 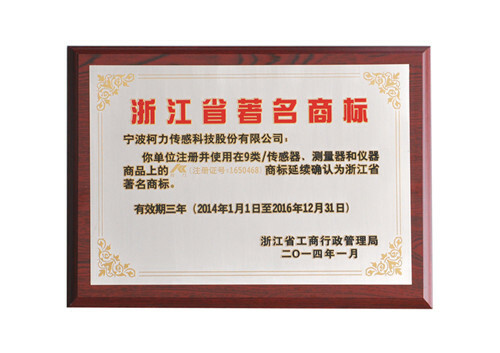 : 1650468) have passed the continued confirmation of Zhejiang Provincial Bureau and won the "Zhejiang province famous trademark" again. "Zhejiang province famous trademark" is identified by the Zhejiang Provincial Administration of industry and commerce. After identified assessment, the valid period is three years. Our first identified assessment is in January, 2011. Copyright 2014 Keli Sensing Technology (Ningbo) Co.,Ltd. All Rights Reserved.